After a great debut CD entitled ‘Future’s calling’, helped along by Hammerfall’s Joacim Cans, who co-produced the CD and appeared as a guest vocalist, the awaited 2nd CD has arrived. Entitled ‘Eye for an eye’, it continues the trend of heavy/power metal heard on the debut. Although it’s fairly obvious that Dreamland are Hammerfall worshippers and the music is very similar to theirs, ‘Eye for an eye’ tends to move away from that typical Hammerfall sound. In fact, I found more similarities with another young band called Machine Men, especially with the way they sound on their current new CD, ‘Circus of fools’. Dreamland vocalist Joacim Lundberg (do you want any more similarities with Hammerfall) is one talented singer, again drawing similarities with Machine Men’s vocalist, Toni Parviainen. He has a superb range, loads of emotion, and a decent set of lungs. On both Dreamland CDs, his vocals are just one of the many highlights. 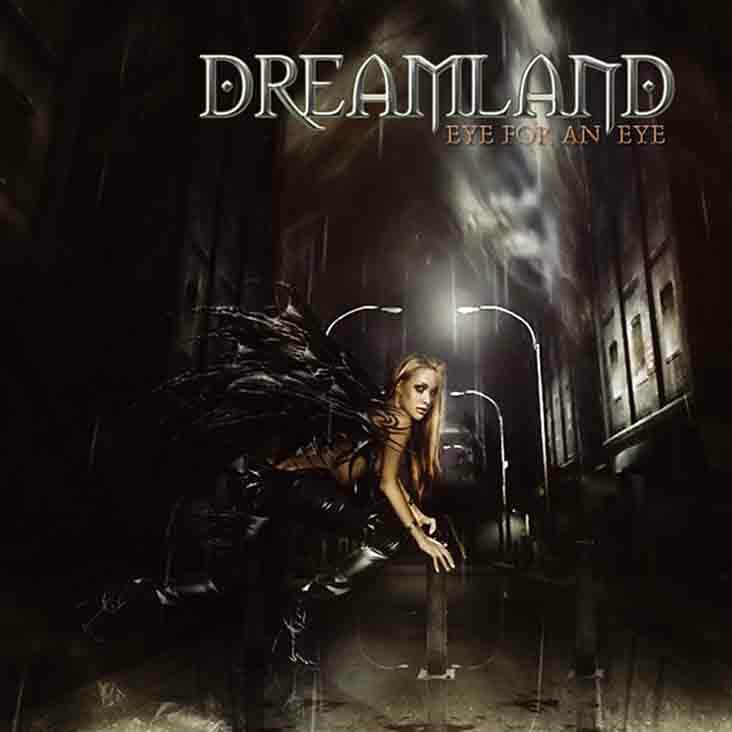 As for the new CD ‘Eye for an eye’, Dreamland have a more matured sound than from their debut. Although that may sound good, the excitement and exuberance that was on ‘Future’s calling’ has slipped a little with the new release. It sounds more laid back, melodic and structured, but the awesome twin guitar blasts and ripping solos are still present. The matured and structured sound however, makes this CD seem a little uninspired and somewhat inconsistent. The quality of the songs range from average to very good, but there are no “killer” tracks. Still, that being said, some of the better tracks on the CD, in my opinion, would be the title track “Eye for an eye”, “Chosen ones”, “Shadows of the night”, “Children of tomorrow” and “Revolution in paradise”. The best track on the CD would be the mid-paced rocker, “Forever and ever”. It’s almost a ballad, but is still rather heavy with a great whole band shouted chorus. Overall, I wouldn’t say I am disappointed with ‘Eye for an eye’, but I will say that it is not as good as their debut CD. I feel that it's just missing something which was apparent on ‘Future’s calling’. Which step this band takes for their 3rd release is up in the air at this point, but I’m hoping it will be a mix of both CDs, and hopefully Joacim Cans continues to help this band as he has done a fine job so far. Dreamland are a gem that have not received a great deal of exposure. This relatively unknown Swedish power metal band have a few of famous names behind their second album Eye For An Eye, Andy LaRocque of King Diamond fame has produced this album, Jesse Lindskog from Dragonland executes drumming duties as the newest edition to the lineup and Joacim Cans from HammerFall is responsible for the production of the vocals. So what does ‘Eye For An Eye’ have to offer? Well, the production is rather sleek and benefits the band wholly. The sound is a traditional heavy metal, too similar to HammerFall, Cans meddling obviously had some sort of effect. The drumming is rather fresh and fails to become stagnant, especially on the opener ‘Eye For An Eye’. The album sustains the listener’s interest with the addition of well structured ballad style songs like ‘Spread Your Wings’. The closing track ‘Revolution In Paradise’ is a powerful hit, very impressionable, especially with the change in vocal styles. The only plagues this album suffers are the riffs which at times appear mediocre and the album will certainly get dull after several repeated listenings. Nonetheless, this is still worth acquiring for modern heavy metal decency - a genre that does not manifest itself so commonly these days.